Jennifer Rosengarten, who received her bachelor’s degree in painting from Wright State, was commissioned to create paintings for Miami Valley Hospital South. Hannah Beachler '05 returned to Wright State to talk to students about filmmaking and winning an Oscar for her work on "Black Panther." 2006 Wright State fine arts grad Erika b Hess interviews artists, curators, collectors and gallerists on her popular "I Like Your Work” podcast. 2002 Wright State film grad Scott Marshall has produced World Wrestling Entertainment shows around the United States and in Colombia, Panama and the Czech Republic. 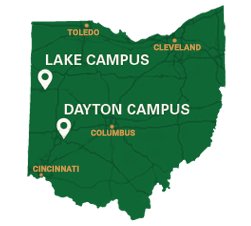 Wright State students interested in criminal justice careers interacted with alumni and other professionals who have flourished in those fields. Hannah Beachler, who graduated from Wright State in 2005, is the first African American to win an Oscar in the Best Production Design category. The awards honor programs and educators that challenge students and promote standards of excellence. Wright State alumni contribute to Dayton's arts world through the Front Street Studio Gallery. Wright State School of Music grads James Edwards-Kenion and Cory Wilhite turned internships into jobs with the Dayton Performing Arts Alliance. 2006 Wright State graduate Reza Masoudi and his wife, Bahar, saw their dress-making business take off after the exiled empress of Iran wore one of their creations.